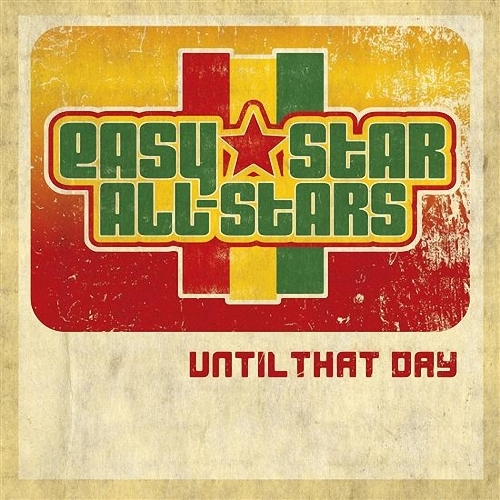 Until That Day is the third release by reggae collective Easy Star All-Stars. 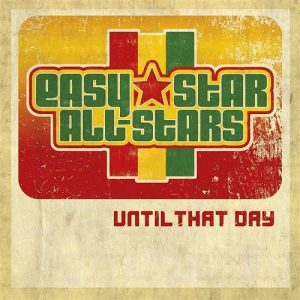 Following the success of their first two albums, reggae and dub interpretations of Pink Floyd’s The Dark Side of the Moon (Dub Side of the Moon) and Radiohead’s Ok Computer (Radiodread), Easy Star All-Stars released an EP of original material. The first thing that you will notice when listening to Until That Day is the number of distinctly different vocalists that appear on this 25 minute EP. They range from the smooth vocal melodies of Junior Jazz on Got to Get Away and Tamar-kali on Like the Stars to the frantic “WAAAH” cries and rowdy vocal delivery of Menny More on Bed of Rose and The Finest as well as Until That Day, which shows him in a more restrained role. These conflicting styles, while well executed, are the biggest dividing line on the EP because some of them hardly sound like they belong on the same release. However, being an EP as well as the first body of original work from Easy Star All-Stars, it could be seen that the intention is to show off a variety of styles to avoid being pigeon-holed one way or the other following their successful reworking of two famous albums. With the first song, Got to Get Away, the focus is placed on vocalist Junior Jazz and his lyrics which deal with stress and enduring it through the Rastafari faith (they’re fighting everything I do/but with the help of Jah I’m going through). The relaxed nature of the song combined with the positive lyrics make for a welcoming introduction to the EP whereas Bed of Rose quickly shakes things up with an alarm-like brass section accompanied by the frantic “WAAAH” cries of Menny More, which are matched by the choppy drum fills near the end of the song to shake up the pace early on. Rastafari themes return more extensively on the titular song courtesy of Ras I Ray and this could alienate some listeners who are not familiar with the religion but the infectious nature of the song will win over many listeners regardless of the lyrics because the lively brass arrangement proves to be the single biggest earworm on the EP. The final song, Dubbing Up the Walls, is a dub remix of their Climbing Up the Walls cover from the aforementioned Radiodread album. Starting out with a slow and ominous brass bellow, this version places a much bigger emphasis on mood by making liberal uses of percussive echoes and low, unassuming bass playing to go along side Tamar-kali’s disembodied voice which sits in between the other instruments instead of on top of them as heard on Like the Stars. The only real divisive element found on Until That Day will be determined the listeners own preference in singers and to a lesser extent some of the lyrical content. However the well-arranged brass instrumentation littered throughout the EP, along with the overall positive message put forward, will most likely win over new listeners.